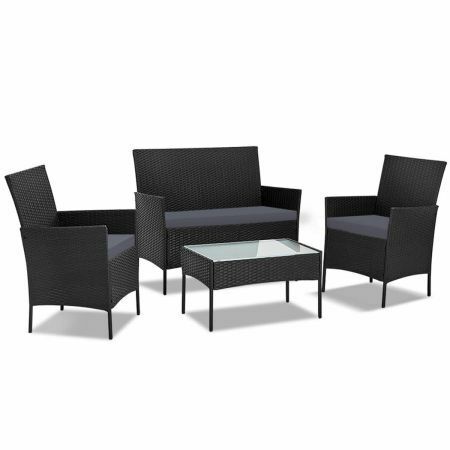 Meticulously crafted, this Gardeon 4-piece Rattan Outdoor Set comprises a chic loveseat, two single armchairs and one matching side table for a beautiful integrated look. Its presence will definitely add panache and style to your deck, patio or even living room. 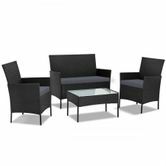 Made of eco-friendly PE wicker and a sturdy steel frame, this set is designed to last through all weather and the test of time. The 5mm tempered glass top for the side table also ensures a strong and safe use with total peace of mind. Not least, the cushion covers are removable and washable to maintain their pristine appearance.